CAREY — Although the Carey softball team took an early three-run lead after three innings, the Clyde softball team responded with four runs in the fifth inning, eight in the sixth inning and another in the seventh to pull away for a 15-6 victory on Tuesday at Water Works Park. MOUNT BLANCHARD — Riverdale extended — and nearly won — the game with a two-out rally in the bottom of the seventh but ended up taking a 9-3 loss to Allen East in nine innings Tuesday in a nonleague baseball game at Riverdale. MOUNT BLANCHARD — Trailing by four runs heading into the bottom of the seventh, the Riverdale softball team rallied by scoring three runs but came up short in a 10-9 loss to Allen East on Tuesday at Riverdale. 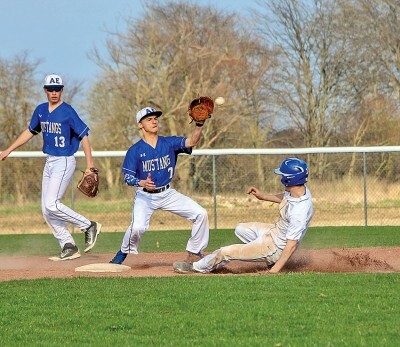 The Mustangs scored two runs in the first and second innings, three in the fourth inning, one in the fifth inning and two in the seventh inning to take a 10-6 lead heading into the bottom of the seventh. CAREY — Both offenses started hot and cooled late, but Clyde did a little more damage at the plate and took a 13-7 victory against Carey in a nonleague baseball game Tuesday at Memorial Park. The Fliers (6-7) and Blue Devils (2-9) combined for 18 runs in the first three innings, but only two runs were scored in the game after that. Riverdale’s Libby Burd clears a hurdle in a home meet Tuesday. Results from the meet were not available. The Wyandot County Farm Bureau sponsored a Young Ag Professionals bowling event Tuesday at Bowlmore Lanes in Sycamore. Ohio Farm Bureau State Trustee Rose Hartschuh spoke about Nebraska flood relief efforts and her Farm Bureau experiences from local to national levels. SYCAMORE – Mohawk found some offensive success against the Northern 10 Athletic Conference’s top pitcher but it could not slow down Bucyrus’ offense in a 12-5 loss to the first-place Redmen on Monday in Sycamore. Paityn Clouse and Tess Weinandy each hit two-run home runs for the Warriors (7-3, 3-3 N10). But it was not nearly enough to match the 16 hits by Bucyrus (9-4, 6-0 N10). SYCAMORE – Trevor Ley shut down Mohawk and got a five-run fourth inning from the offense as Bucyrus took a 5-2 victory in a Northern 10 Athletic Conference baseball game Monday at Mohawk. Ley (2-2) limited Mohawk to six hits and no walks with seven strikeouts.